Our 12 year old son wants to learn how to play guitar. The guitar teacher is a lovely single woman who doesn’t have time to cook for herself. So, we bartered for half of the teaching fee. Every week I bake Cary something wonderful! This week, it was small whole wheat, spinach, herb and Parmesan pizza crusts. I made 15 (10-inch) pizzas, pre-baked them, let them cool and packaged them for the freezer. 4 went to Cary for her freezer and all she has to do is take the crust from the freezer, top it and bake it in a pre-heated 475 oven until the toppings are done and the crust is tender. Needless to say, Cary was elated. The batch baking session was done early in the morning while the family was asleep and then I cleaned up the kitchen for the rest of the day. Some of the crusts go into OUR freezer for those hurried, frenzied days and some are for our table tonight. The crusts are small enough that each child can have their own pizza with their own individual toppings and have some left over for lunch tomorrow. Thaw frozen spinach and place in a large mixing bowl. Pour 3 cups boiling water over top and let sit. If desired, puree the spinach and water in a blender or VitaMix. Let mixture cool to 110 degrees. Place the cooled spinach and water into a mixing bowl (I use a Bosch) and add 6 cups of flour. 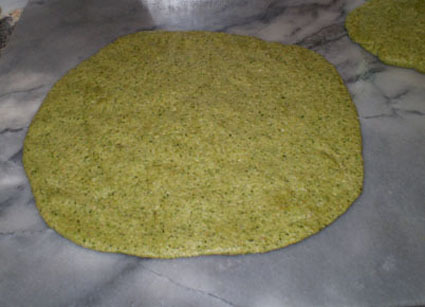 Place yeast on top of the flour and mix into the spinach and water. Cover the bowl and let sit until the yeast is bubbly, about 15-30 minutes. (This is called sponging). When sponge is bubbly, add the remaining 3 cups of warm water and the rest of the ingredients and mix well. Knead for 10-12 minutes by hand, or 6 minutes by large mixer. Let sit for 5 minutes. Pre-heat oven to 500 degrees. If you have a pizza stone, place it in the oven to pre-heat. On an oiled surface (not floured), place the entire batch of dough. Cut off pieces and weigh to get consistent-sized pizza crusts. For larger 16 inch pizzas, each piece should weigh 1 pound 8 ounces. 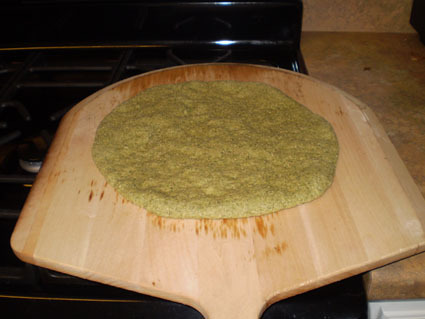 Roll pizza crust to desired thickness on a piece of unbleached parchment. Using a pizza peel, slide the pizza crust onto the pre-heated stone and let cook for 6-8 minutes. 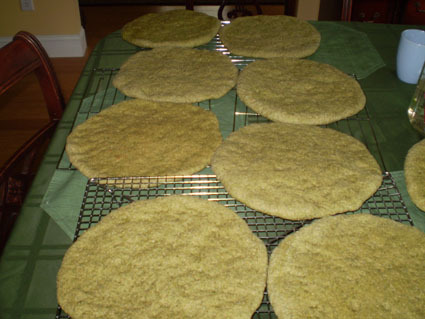 Remove crust to a cooling rack and repeat with remaining crusts. Turn pizza crust over, so the bottom is now the top. Place sauce and/or toppings on the crust and again using the parchment paper and peel. Bake until toppings are cooked – about 8-10 minutes. Let the crusts cool completely and place crusts in a large bread bag, each crust separated by parchment paper to prevent sticking. Freeze flat. Pre-heat oven to 500 degrees. Remove crust(s) from the freezer. Thaw crust if desired, but it is not necessary. Turn pizza crust over, so the bottom is now the top. Place sauce and/or toppings on the crust and again using the parchment paper and peel. Slide into the oven. *DO NOT pace a frozen pizza onto a pre-heated stone. * Place frozen pizza directly onto the oven rack or use a baking sheet on unheated stone. Bake until toppings and crust are cooked through – about 8-10 minutes if crust has been thawed, about 15 + minutes if the crust was still frozen. Per Crust: 374 Calories; 4g Fat (9.5% calories from fat); 16g Protein; 75g Carbohydrate; 14g Dietary Fiber; 1mg Cholesterol; 811mg Sodium. Exchanges: 4 1/2 Grain(Starch); 0 Lean Meat; 1/2 Vegetable; 1 Fat; 0 Other Carbohydrates.